After the Glasgow School of Art censored an artwork by master of fine art student James Oberhelm from a May 2017 interim show when it was deemed to contain “inappropriate content”, the commitment of the world-famous institution to free speech has again come into question. Students enrolled in the programme were issued an updated handbook in November 2017 with provisions that would make such censorship much more likely and much easier to enforce in future. These were without precedent, urging students to exercise caution when it comes to “offensive” or “inappropriate” material and warning against “bringing the institution into disrepute”. It goes on to say that the “right to freedom of speech is not absolute”, requiring students to adhere to the “highest ethical standards” and “ethical good practice”. Over two-thirds of MFA students at the school have signed a petition calling for such rules to be removed and demanding an environment where they can work “free from the threat of being banned by GSA”. “Censorship is fundamentally a point of principle, even if it doesn’t affect an individual practice right now,” it adds. Oberhelm is one of the 34 out of a total of 50 MFA students who have signed the recent petition. His artwork, “Effects” [The Enthronement], explored the geopolitics of the Middle East and included a propaganda video created by Isis. An email between staff members at the art school stated that Oberhelm’s “needs to be looked at by the Prevent Group”, referring to the UK’s counterterrorism legislation Prevent. Past and present staff at the institution have confirmed to Oberhelm that this was the first case of censorship in its history. 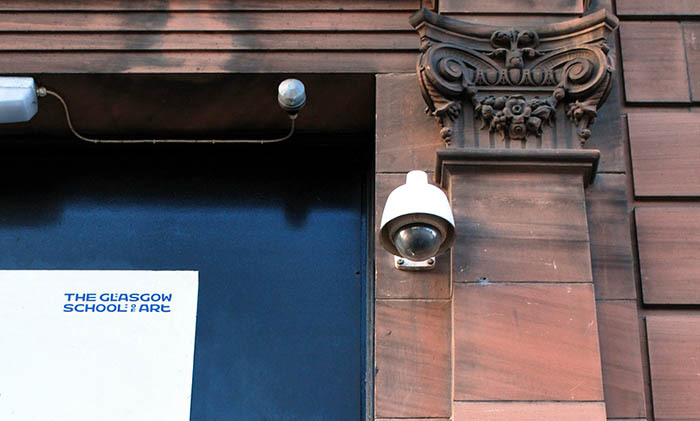 But Oberhelm remains hopeful that the Glasgow School of Art “still has the wherewithal to defend its reputation by removing these written directives, and ceasing the practice of briefing incoming postgrad students to police their art practice, rather than allow its reputation to become steadily more tarnished”.